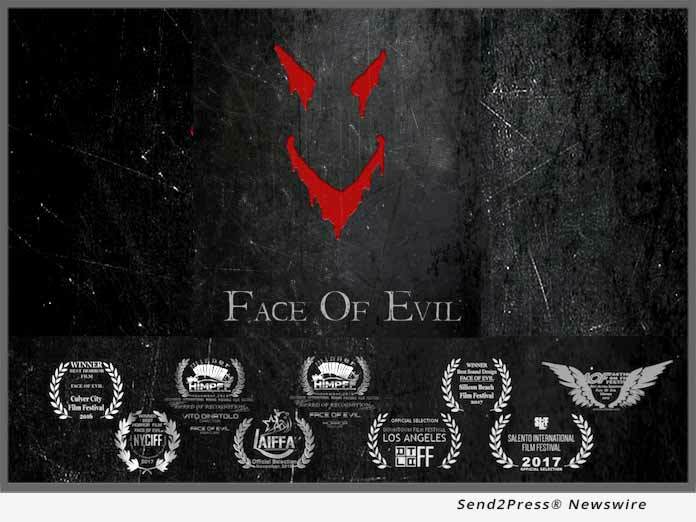 Awarded feature film “Face Of Evil” (F.O.E.) is being released by Gravitas Ventures and is now available on Video On Demand and DVD, right on time for your July 4th party! “This psychological thriller horror is also very entertaining and grotesque, and it’s ideal for your post-barbeque chilly-afternoon movie-time,” says the film’s writer/director Vito Dinatolo, of V-Movie. (LOS ANGELES, Calif.) — NEWS: Awarded feature film “Face Of Evil” (F.O.E.) is being released by Gravitas Ventures and is now available on Video On Demand and DVD, right on time for your July 4th party! “This psychological thriller horror is also very entertaining and grotesque, and it’s ideal for your post-barbeque chilly-afternoon movie-time,” says the film’s writer/director Vito Dinatolo, of V-Movie. On July 4th, Private Jay Williams returns home from the Middle East, but a mysterious epidemic breaks out and starts infecting his friends at the party. The night has just begun. * VOD: Amazon Prime Video; iTunes; Google Play; Vimeo; Xbox; Youtube Video; Vudu; PlayStation; Comcast; Cox; Dish Network; Verizon FiOS; Sudden Link; Mediacom; Insight; Wow; Eastlink TV. The soundtrack, from electronic to rock, pop, hip hop and whatnot, will be available everywhere on July 23, 2018.